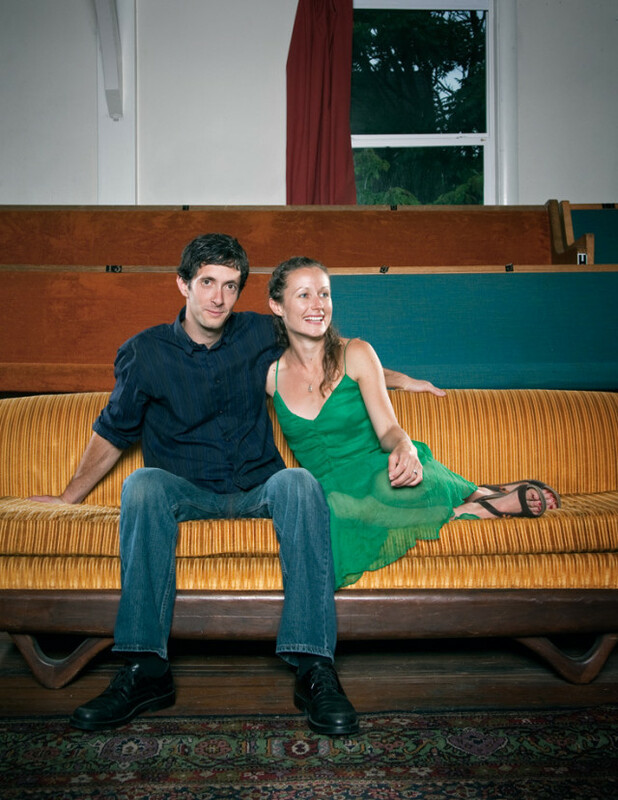 Extra notes and quotes from our fall arts edition’s theater couple. “I love her very much even though she makes out with other guys,” jokes Portland Playhouse artistic director Brian Weaver, casting a mischeivous glance at his actress wife Nikki as the two recount how some of the taut, modern plays that their company favors have required Nikki to get pretty personal with her costars. While playing a social-climbing Hollywood party girl in last season’s The Scene, Nikki pounced on actor Leif Norby, brastraps akimbo, while Brian toughed it out from the control room. “The stage manager could start and stop the makeout sessions with cue lights,” he explains. “He was taunting me, going, ‘Should I stop her now? How about now? Just a little bit longer!’” But it would seem the Weavers are no strangers to leaps of faith. That “something” was Portland Playhouse, a small but serious theater company that the Weavers set up in a former church on Prescott and 6th, still fitted with old pews and a large stained-glass window. Initially, Nikki admits, it was hard to find their footing. “The first play we did, only one person showed up. After that show we were like, ‘Wow, what are we gonna do?’ Everybody’s an artist here; everybody’s some kind of creative. So it was nervewracking, especially during that first year. You know, you’re trying to figure out, Do I need to get a part-time job, or can I make a living doing this…. ?” To strengthen bonds with the local theater community, Nikki began acting with other companies in Portland—and to sustain her stamina and cash flow, she got a few gigs teaching yoga. Meanwhile, Brian put in 60-hour workweeks at the church as Portland Playhouse’s creative director, poring over scripts, applying for grants, and helping manage the house day to day. With the help of executive director Michael, the pair’s efforts paid off, and their audience gradually grew to almost 100 each night. Unfortunately, as they enter their fourth season, audience interactions may be harder to host. In July, the Playhouse was suddenly (and they hope temporarily) asked to move its fall offerings offsite due to zoning concerns. Still, the Weavers are confident that their plan to produce six plays, mentor nine acting apprentices, and guide eight high schools through performances of Shakespeare’s Hamlet will go forward without a hitch. (“_Hamlet_ is a great fit for high school; all high schoolers feel like Hamlet,” Nikki half-jokes.) October’s Gem of the Ocean and December’s Angels in America will be performed at the World Trade Center. For other updates, the Portland Playhouse Website will keep us posted.